Dreher is best known as a proponent of the so-called “Benedict Option,” in which Christians would retreat from this sinful and fallen society and form their own communities. And yet, for some reason, Rod has not yet retreated, continuing to gift us opinions like calling what he terms “transgenderism” a “cult” and implying, without evidence, that kids are peer pressured into becoming trans. As the New Republic points out today, he’s also fallen into a number of controversies around race, as he keeps making bad, thin, and easily disproved arguments about the superiority of (implied: white) Western civilization. Somebody in my Twitter feed last night observed that “the Internet” was making a pretty good case for Anthony Bourdain’s suicide being tied to the occult. Say wha’? Lo, it turns out that his girlfriend Asia Argento is a witch, and not just a casual one either. There’s lots of extreme darkness there, right in the open. She flaunts it. Bourdain, the poor fool, was doomed the day he met her. Dreher links there to an extremely credible-seeming site called Vigilant Citizen, in which everything, pretty much, is taken as a symbol of the occult. A sort of peace sign that Argento flashed on the red carpet one time, Kat Von D’s wedding, the death of XXXTentacion: the devil is, truly, hard at work. Vigilant Citizen identifies Argento as “occult elite,” because she’s the daughter of famed horror director Dario Argento and has talked online about esoteric spirituality and magic and witchcraft. Do you remember a few years back when some Satanists in Detroit erected a large statue of Baphomet, and caused public controversy over it? The BBC spoke to Lucien Greaves, a Luciferian priest, asking him to decode the symbolism of the statue. Lucien Greaves is not a “Luciferian priest,” but the spokesperson for the Satanic Temple, a non-theistic Satanist organization that regularly engages in spirited trolling to make points about religious liberty. The boy and girl are two children who are at Baphomet’s feet, and look up worshipfully at it. The point here is that the destruction of male and female is satanic. The rapid and forceful mainstreaming of transgenderism, abetted by technology, is causing the physical and psychological destruction of so many children and teenagers. It is not coincidental. All of this is so profoundly vapid, incoherent and bizarre, that Dreher was forced to publish several updates to his column. “Um, no,” reads the first, “I don’t think Asia Argento killed Anthony Bourdain. Come on. I think the darkness around her did an already unstable and depressive man any good at all.” The second claims that he just got off the phone with a former “Luciferian” friend (sure, Rod) who totally agrees with him. Hey, I took down the Bourdain post because it was being widely interpreted as disrespectful to Bourdain’s memory. I apologize; that was not my intent. I’m a big admirer of his, and do not want to insult him inadvertently. Plus, I’m going to be away from the keys all morning, and not able to manage comments. P.S. 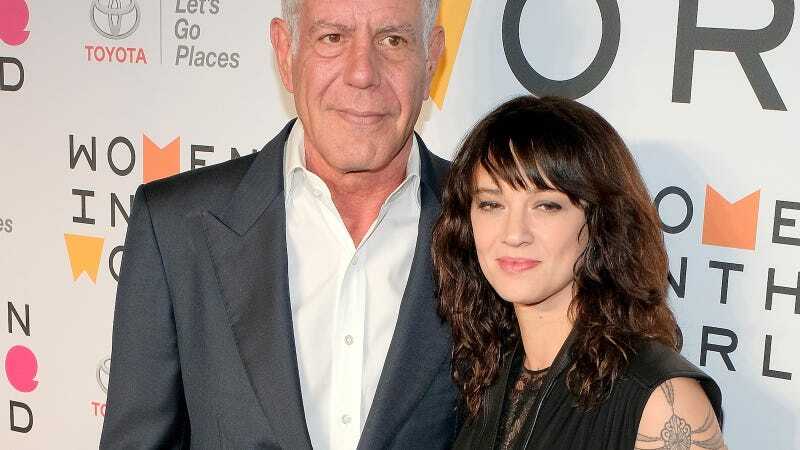 And I apologize for not being clearer in my post: I do not blame Asia Argento for Bourdain’s suicide. Bourdain is responsible for Bourdain’s suicide. I regret that I implied otherwise. Thus ends another, very dumb chapter in Rod Dreher’s curious career. For good measure, however, we reached out to Lucien Greaves for comment, the spokesperson for the Satanic Temple. He offered a statement that Rod could perhaps refer to the next time he tries to do some critical thinking. It’s difficult to debate such half-formed thoughts and nebulous innuendo. Dreher asserts that Bourdain, “the poor fool,” was doomed “the day he met” Asia Argent, though later he updates to say that he’s not foolish enough to believe Asia killed him — “Come on”! — only that her occult-related “darkness” did him no good. The digression about Baphomet and “[t]he rapid and forceful mainstreaming of transgenderism” having taken a psychological toll on Bourdain, unqualified by any evidence, is facially absurd. Why should Bourdain be uniquely affected? And if the psychological toll of the Rights Revolution isn’t unique to Bourdain, why are we not experiencing a dramatic increase in rates of suicide nationwide? * And what of the transgender people who are less likely to commit suicide in a more welcoming culture? And who said “transgenderism” was a particular fixation of Argento’s occultism to begin with? If Dreher is truly concerned about religious practices having deleterious psychological effects that lead to destructive behaviors, I should like to direct him to investigate the phenomenon of sexually predatorial pederast priests.